NTA UGC NET June Exam 2019 Admit Cards , UGC NET Admit Card 2019 Download now for June 2019 exam on NTAnet website: NTA would be releasing the UGC National Eligbility Test or NET June 2019 Admit Cards soon. NTA would be conducting the UGC NET 2019 examinations on (Exam dates: June 20 to 28, 2019). As per past trends and a general practice followed by the board, the admit cards for UGC NET 2019 June examinations are expected to be released early next week. The admit cards would be released on the official website NTAnet.nic.in. 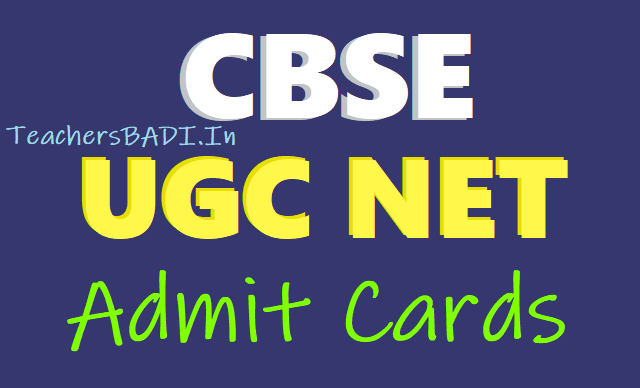 UGC NET June 2019 Admit Card, Exam Date: The UGC NET examination will start from June 20 and will continue till June 28. The National Testing Agency (NTA) has released the schedule of examinations in its official release. The candidates who will appear for the examinations scheduled to be held from June 20 can download the admit card from June 11. The admit card will be available to download at ntanet.nic.in, and will contain the details of city and centre. 1. Candidates appearing in UGC-NET should clearly specify in the prescribed application form whether they are applying for 'only Assistant Professor' or 'for both Junior Research Fellowship (JRF) and Assistant Professor'. 2. The candidates who qualify the test for eligibility for Assistant Professor will be governed by the rules and regulations for recruitment of Assistant Professor of the concerned universities/colleges/state governments, as the case may be. 3. The candidates who qualify for the award of JRF are eligible to pursue research in the subject of their post-graduation or in a related subject and are also eligible for Assistant Professor. The universities, institutions, IITs and other national organizations may select the JRF awardees for whole time research work in accordance with the procedure prescribed by them. 4. Candidates falling under Scheduled Caste(SC)/Scheduled Tribe(ST)/Persons with Disability (PwD)/Transgender/Other Backward Classes(OBC)(Non Creamy Layer), as per the central list of Other Backward Classes available on National Commission for Backward Classes (www.ncbc.nic.in), will be given special concessions as may be decided by the UGC. 5. Candidates qualifying for the award of JRF will be eligible to receive the fellowship of UGC under various schemes, subject to their finding placement in universities/IITs/Institutions. 6. However, for those candidates who have joined MPhil/ PhD, the date of commencement of fellowship shall be from the date of declaration of NET result or date of their joining, whichever is later. The NET examination will be conducted from June 20 to 28. 18.12.2019 9.30 a.m. – 1.00 p.m. 2.30 p.m. to 6.00 p.m.
19.12.2019 9.30 a.m. – 1.00 p.m. 2.30 p.m. to 6.00 p.m.
20.12.2019 9.30 a.m. – 1.00 p.m. 2.30 p.m. to 6.00 p.m.
21.12.2019 9.30 a.m. – 1.00 p.m. 2.30 p.m. to 6.00 p.m.
22.12.2019 9.30 a.m. – 1.00 p.m. 2.30 p.m. to 6.00 p.m.
UGC NET June 2019 Admit Card Download to begin by June 11 on NTAnet.nic.in, exam on (Exam dates: June 20 to 28, 2019): University Grants Commission’s National Eligibility Test, UGC NET June 2019 admit cards are expected to be released within this week. The UGC NET 2019 or NTA UGC NET 2019 Exam Date is scheduled for June 18, 2019. Accordingly, NTA UGC NET 2019 June examination admit card is expected to release by November 19, 2019 on NTAnet.nic.in. Candidates who have registered for the NET June 2019 examination are advised to note that the notification for release of admit cards would not be shared on the email id. Candidates are required to check the official website for any updates regarding the same. Any important update or notification regarding the examination would be released on the official website NTAnet.nic.in. Also, this year, the examination pattern for NET June 2019 examination has been changed. As per the revised pattern, there would be only two papers this year – Paper I and Paper II. Candidates are advised to go through the detailed notification available on the official website. This year, the age limit for Junior Research Fellowship was also extended from earlier 28 years to 30 years.NTA conducts NET examination twice every year. Usually the examination was conducted in the month of January and September every year. However, a notification was released last year as per which the examination would be conducted only once a year. Every year, more than 5 lakh candidates register for the examination. Candidates who have applied for the NTA UGC NET 2019 June Examination are hereby notified that the board would not be sending the admit cards to the registered email address. Candidates are required to check the official website for any updates regarding the examination as well as the admit cards. Also, important information like the examination centre and reporting time would be available on the admit cards. Please note, as per the official notification released by the board, the NET 2019 Admit Cards would be released in the month of June. NTA usually releases the admit card 15 - 21 days ahead of the date of the examination. Note: Candidates are advised to check all the information printed on the admit cards carefully. To check updates on the admit cards, candidates are advised to constantly check the official website NTAnet.nic.in. The information regarding the admit card download would be released by the board on the website NTAnet.nic.in as well as on NTA.nic.in.NTA is the conducting board for UGC NET examination. The responsibility of NTA is limited to organising the examination and releasing the results. The recruitment as JRF and Assistant Professor profiles is done by UGC. The examination is scheduled for June 20, 2019. NTA would be conducting the University Grants Commission National Eligibility Test, UGC NET 2019 from June 20. UGC NET is conducted to determine the eligibility of Indian candidates for Assistant Professor or and Junior Research Fellowship in Indian Universities and colleges. Final answer keys of all the papers and the scanned response sheets of the candidates would be uploaded to the website and the final answer keys of all the papers will be displayed on NTAnet.nic.in in the fourth week of August.NET would be conducted in 84 subjects across 91 selected cities spread across the country. With only 5 days remaining for the examination to be held, given below are some important instructions as laid down by NTA in the official notification. Candidates must adhere to the following rules. Non-compliance may lead to failure of candidature. 1. A photo identity card is to be carried by the candidates along with a print out of their online Admit Card on the day of examination. 2. There is no negative marking for incorrect attempts. It is sincerely advised that candidates attempt every question. 3. As per the official notification, candidates are supposed to report at the examination centre 2 hrs 30 minutes prior to examination commencement and cooperate with the invigilating staff at the time of frisking. No candidate will be permitted to leave the examination hall before 10 am in the 1st session and 1 pm in the 2nd session. 4. The candidates have to obey to the instructions given by the invigilators in the examination hall and should not argue with the invigilators or other staff involved in the examination duty. 5. All the examination halls would be having a wall clock so the candidates are not supposed to wear any type of watch to the hall. The use of calculators in log tables is not allowed. Mobile phones, electronic devices, paper bits and chits, books/notebooks etc. are not allowed inside the room. If candidate(s) are found in possession of any of these items, they will be treated as cases of unfair means and their result will not be declared.